A poll shows Kasich would beat Hillary Clinton in his own state, Ohio, by 7 percentage points. 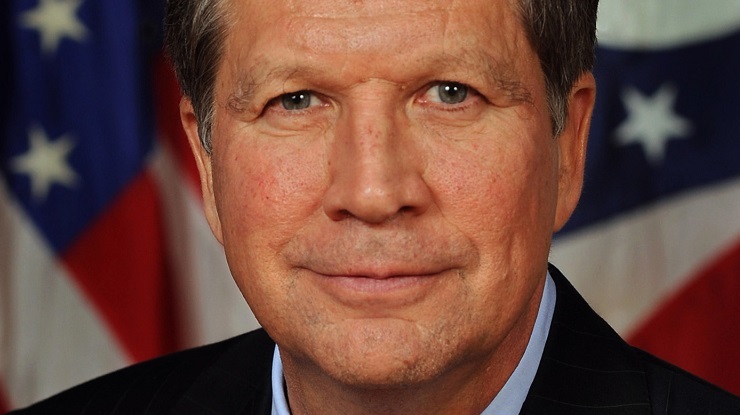 (Bloomberg Politics) — Even before he managed to snag a spot in Thursday’s Republican presidential debate, Ohio Gov. John Kasich has argued that he’s the person best suited to win his home state in the general election. Based on how his state has responded to his moderate stances on issues like Medicaid, he may have a point, and the debate in his home state may help heighten that contrast. Over the years, the governor has developed a reputation as a moderate (or a RINO, as conservative critics have labeled him) for his willingness to work with Democrats on immigration reform, his support of Common Core (he’s called conservative opposition to the national education standards “hysteria”), and, most controversially, his state’s acceptance of the Obamacare Medicaid expansion. Kasich’s presence at Thursday’s debate in Cleveland serves as a reminder that the GOP’s best chance for winning the bellwether state might be found in the moderate stances candidates tend to take during the general election, and Kasich has taken his share. When the Republican legislature declined to accept the Medicaid expansion, Kasich lobbied the state’s Controlling Board, a panel made up of six lawmakers and an administration official. By November 2014, 450,000 newly eligible Ohio residents enrolled in the government-run program. Kasich has defended the expansion as a moral responsibility, once arguing that when he dies and goes to heaven St. Peter wouldn’t ask him about what he did to keep government small, but about what he did to help the poor. And while the Medicaid expansion is often mentioned as a liability for Kasich’s presidential campaign, the residents in his state largely approved of his efforts. A November 2013 Quinnipac poll found that 51 percent of 1,361 registered Ohio voters surveyed supported expanding Medicaid, compared to 41 percent of voters who did not. Of course, that support came primarily from Democrats and independents—only 28 percent of Republicans supported the expansion, and 23 percent of all voters said the move would make them less likely to vote for Kasich’s re-election. A poll from the left-leaning Public Policy Polling group from a week earlier produced a similar result—Kasich would beat Clinton in the state, and he had a 72 percent job approval rating among Republicans.